In our Vedic culture, cows are very sacred and are given respect tremendously. Divine kamadhenu cow appeared during churning of ocean. In Vedas, the glories of cows are profusely mentioned. The main purpose of Vedas are not only to offer sacrifices to worship supreme lord but also to his representatives .The whole world is maintained and nourished by sacrifices. All the ingredients of sacrifice come from holy cow. Again, in absence of sacrificial offerings etc cow’s milk is one of the most important ingredients. Even the performer of sacrifice during the initiation drinks panchgavya. goodness, purity, auspiciousness, strength, happiness and opulence. If we see a holy cow during yatra (spiritual journey) or see her first in the morning is considered very auspicious. Cow’s holy body is considered extremely pure. In fact, the waste of cow’s body, i.e. cow dung is highly pure and place of residence of mother Laxmi. This cow dung strengthens Laxmi ji. When a land/ place is plastered / covered with cow dung it is free from faults, clean, pure and is considered perfect. This has been described in Kalpa scriptures in various texts. . Similarly, cow urine is as good as Holy Ganges. According to ayurvedic studies cow’s urine can cure many diseases. If we observe our daily activities and sacrifices closely then we will see that cows are inseparable part of our life. Demigods cherish grains like barley, rice and til (sesame) grains, which grow on manure of cow dung and sown while ploughing with a bull. . So we can clearly notice that without gavya like milk, curd, ghruta (clarified butter), it is impossible to conduct yajnas and without yajanas and gavyas it is impossible to conduct samskaras i.e. inspire culture. Vedic culture cannot be established, sustained and grown without gavyas. Vedas and purananas clearly mention the importance, maintenance and improvement of go vamsha (cow progeny). In many puranans, it is clearly stated that cow is responsible for maintenance of whole creation and humanity. In scriptures, it is mentioned that following seven entities can maintain humanity and the creation. Following verse is extracted from Mahabharata and Shiv purana. The seven entities are Cows, Brahmans, Vedas, Chaste women, Truthful people, Not greedy ones and Charity. Giving them water to drink etc. All kings from Raghu dynasty, Lord Krishna, Five pandavas, King Dilip, Sage Vasistha have set an excellent example by doing above-mentioned activities. If we serve cows with lot of devotion and love, situation that is not only difficult but also un- manageable becomes easily attainable because in cows body all demigods, sages, tirthas like Ganga etc reside. Even Supreme lord Vishnu is pleased if we serve cows and it becomes easy to attain go loka. Even all epics and scriptures consider go seva (serving cows) as topmost priority even all sages, their disciples and descendents would eagerly look for an opportunity to serve cows of excellent pedigree. Therefore, the descendents of those sages are known by particular gotra. These gotras are even present today standing as a proof of devotion to cows. In conclusion, whole of Vedic culture is revolving around serving cows. By serving cows, the whole nation will be filled with peace, prosperity, knowledge, magnanimity and spiritual progress. In many vedic scriptures including brahmanas, aranyakas, Upanishads etc glories of cows (go mahima), their protection (Go raksha) and various points are considered in their rearing (Go palana) . These scriptures also mention the symptoms and indication of how to recognize divine cows, which give welfare of whole world. Lot of material and instruction are available even in Vedas, itihasas, puranas and dharma shashtras. In all scriptures it has been mentioned, how one can get highest spiritual and material destination by serving cows and suffer if we give them pain. purifying items. As a result, there is lot of peace and prosperity. All entities of the world along with great demigods are satisfied just by serving cows with lot of love and devotion. One who studies this vidya gets material opulence, divine knowledge and finally attainment of spiritual world named goloka with ease and without much effort. Not only in Agni purana but also in other scriptures it’s mentioned and is called as gomati vidya and is found with full detail in Vishnu dharmottar purana. Following is only a translation of Gomati vidya. Reference – Vishnu dharmottar purana – second part – chapter 42, verse 49-58 Son of Lord of water Varuna who is master of pushkar dwipa and knower of all scriptures spoke this Gomati vidya on being questioned by Lord Parshurama. Now I am going to describe this gomati vidya who can uproot all sins, therefore please listen attentively. Cows are always having divine form and a rich, sweet odor, free from sin. They have smell like gugula. All the Entities (species) are sustained by holy cows. They can help us achieve dharma, artha, kama and moksha. Cows are basis of divine energy, which can produce best of grains. They are the ones who provide food for demigods in the form of items for sacrifices including ghee etc. These holy cows make all living entities pure, free from sins and vices just by their touch and darshan (seeing them). They give amruta (elixirs) like milk, curd and ghruta (clarified butter) etc. Her male calves become strong bulls and thus help in carrying loads and in Krushi (agriculture). These cows satisfy the demigods staying in heaven by offering them sacrificial offerings along with Vedic mantras. Even in places of sages and saints cow’s ghruta, milk etc was being used; hence, they would maintain cows with great faith and devotion. If someone fails to get shelter in this world then these holy cows become the shelter for all the living entities in this world. Amongst pure items cows are most pure and the source of all auspicious things. Cows are the staircase for heavenly life and had been always cause of all prosperity. We offer obeisances to holy cows who have given shelter to even Laxmi (goddess of fortune) in their own body. 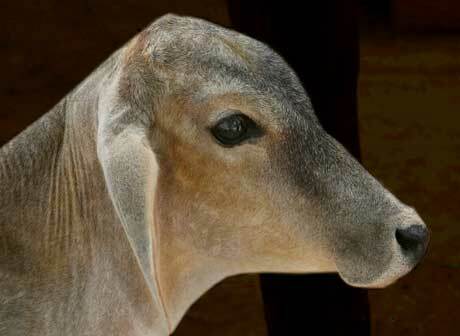 I offer obeisance’s to cows born in family of surabhi who are always pure, simple and fragrant. My obeisance is to cows the daughters of Brahma. I offer my obeisance’s again and again to holy cows that are always pure within and without and that which purify atmosphere far and wide. Actually, cows and brahmanas are from same family as vishudha sattva (pure goodness) is present in both of them. Veda Mantras are present in Brahmanas and havishay (sacrificial offerings) in cows. Both of them perform only sacrifice for the pleasure of Vishnu and demigods because of which all entities are prospering. This whole world is sustained on piety of demigods, brahmanas, cows, saints, holy men and chaste and austere women. These entities are full of suddha sattva (goodness) and thus sustain the universe. Therefore, they are always worshiping able. Those bodies of water where the holy cows quench their thirst and from which ever path they go and cross bodies of water at all those places surely all the holy places like Ganga, Yamuna, sindhu, saraswati etc rivers are present. Place where the cows dwell all holy places and holy rivers like Ganga etc are always present. Even in the dust of cows great merits of religion are present. In cow dung, goddess of fortune is always present and by offering obeisance’s to cows, the chatuspada dharma (religion of 4 principles) is established. Therefore, an intelligent and the man who wants to prosper should always offer obeisance’s to holy cows. pr. i am pitta prakriti, i was told by my grand father that you shud not take gomutra because it is ushna(hot) so that it will increase your pitta, but by seeing the advantages of gomutra i am thanking it is better to take it, what shud i do according to you pr? yes. It is ushna. But it can be taken with full knowledge. Basically following are symptoms which we should be careful of and following ways we can avoid the pitta nature of cow urine. symptoms – general heat in stomach, heavy acidity, ulcers in mouth etc. If such thing happen to one after taking cow urine then he should take it with meals or reduce the quantity or take it alternate days. For some such symptoms will be observed in summer and not in winter. Then they can follow the advise in summer and in winter they can again take cow urine in regular quantity in mornings. I hope this helps. If we are carefull of above points then we can get advantage of cow urine and be safe. Beautiful informatory article. What are the practical ways to serve cows, especially if one is living in the city? Ans – Connect cows to your life somehow or other. Never hate them or avoid them when ever you see them anywhere. Feed them etc.etc. Donate to goshalas etc. thank goodness there are people like madan gopal das and many others who are encouraging bharatvasis to revive their vedic traditions and one of the first steps in this direction is to respect and protect the gaumata. earlier when a cow gave birth, she was worshipped by women who lived near by, today in cities parents teach their children that cows are dirty and should not be touched;such stupid,ridiculous mis-teachings must be countered by providing cows safe and clean places to rest as also clean and healthy food and water must be made available for them. bharatvasis must realise one fact – there cannot be any true brahmins or kshatriyas in bharat if even a single cow is mistreated or killed.if brahmins and kshatriyas,specially these two,cannot protect and preserve our desi cows,then they have very little right to claim to belong to these varnas. MY QUESTION: ONLY VEDIC COW OR ANY COW TO BE WORSHIPPED? Ans – My blog is quiet clear about the answer and I won’t like to repeat it here again. You have given really great information.By which we could able to respect the cows forever. I have read your articles and would like to understand the utility of male cows and people have stopped using ox and male cows for farming also. Is there any other utility which you can let us know . Ans – Other than ploughing bulls are engaged in transportation, grinding grains, extracting oil from oil seeds. There is good demand for oil from bull driven ghani and less production. There can be some other similar engagements. Excellent teaching! For your readers who want to serve , honor and PROTECT the sacred cows, please go to our humble family website where you will find simple people who have devoted their last 16 years to saving, serving and protecting precious cows from the slaughterhouse in Georgia, USA. We depend on donations and are truly in desperate need of them to be able to continue saving their lives. If we have to leave here, they will all go to the slaughterhouse right away and die the most horrifying death imaginable. PLEASE visit our website and PLEASE donate from the depths of your heart. It will literally keep them alive!